The “smells and bells” of Samhain enhance any working and celebration. 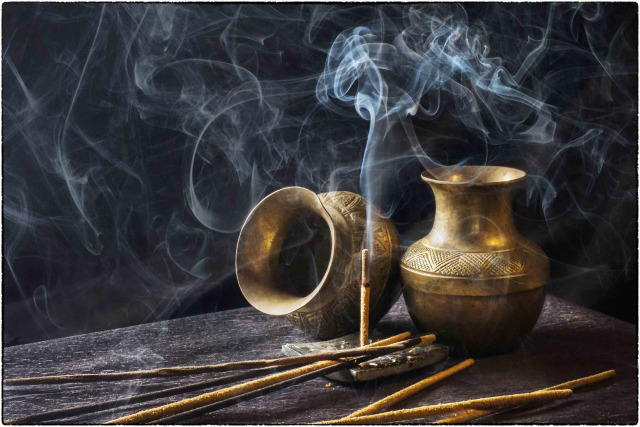 Incense is a staple of this Sabbat and can be used in a variety of ways, from serving as a veiling for ancestor communion to calling to presence the Deities you wish to witness and bless your activities. For those who are sensitive to the smoke emitted from incense, oils can be used in their place, either heated over a small tea light or in a roller version and applied directly (fragrance or carrier enhanced only. NEVER apply an essential oil directly to the skin as these are potent and allergic reactions or skin sensitivities are likely) to the skin.